Sugar Dog Stories – Mozart | Sugar Dogs International, Inc.
On the Sunday before Halloween, 2009, Paula and the Sugar Dogs joined Darla and James for a wonderful event sponsored by Florida Poodle Rescue, Inc. (FPR): the Poodle Picnic! It was loads of fun for the diabetic alert dogs to have a day off to run and play with their Poodle friends on a 17 acre fully fenced farm. And it gave our newest Sugar Dogs member, Pat, Jim’s mom, an opportunity to “shop” for a Poodle to train as a diabetic alert dog. Pat selected Mozart, a 12 year old Maltese Poodle mix that had come to FPR with some health problems that his former family could not handle. He had suffered a slight stroke which left him with muscle weakness in his hind legs and he was toothless. He is solid white, a beautiful “Malti-Poo.” And while his little tongue still hangs out of his mouth, he eats well, has gained weight and now has a forever home with his Mom Pat. He was recently given a clean bill of health by Ark Animal Hospital of Lakeland, FL. Pat was a Type 2 diabetic taking oral medications to control her diabetes. 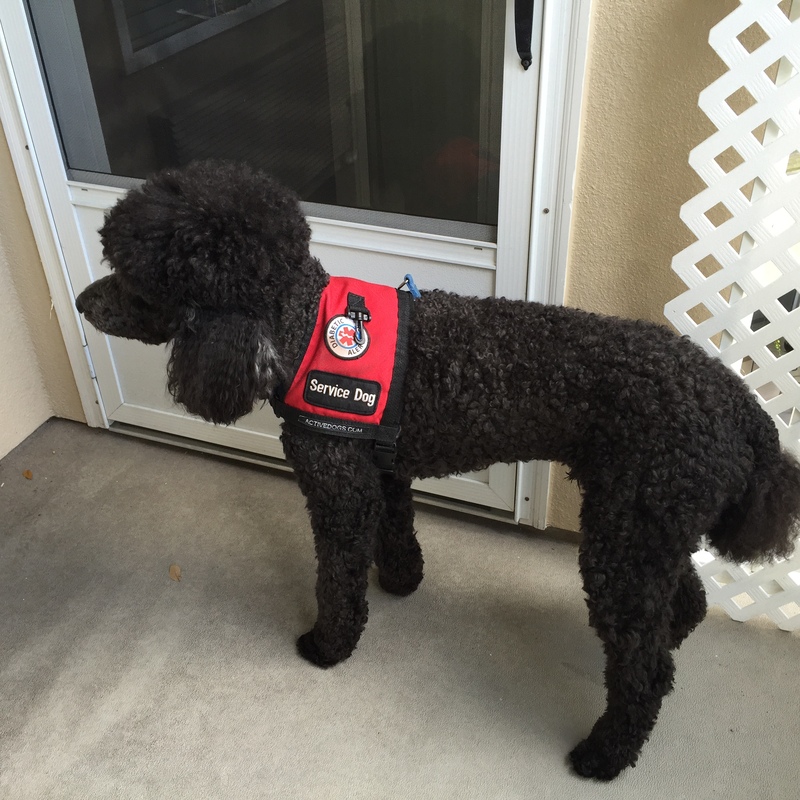 Sweet little Mozart alerts and has been recognized as a diabetic alert dog for many years. Pat lost about 70 pounds since October ’09 as she walks Mozart several times a day. He arrived housebroken and Pat is fastidious about taking him out. Plus she’s in a brand new apartment! Go Pat & Mozart! Mozart is a member of the Social Circle in the greater Tampa Bay area, going out to lunch with his diabetic partner, going with her to visit friends and as she makes her rounds in her various social activities including her extensive volunteer work. He’s a beautiful diabetic alert dog and Sugar Dogs International is proud of him! He has his own Facebook page. Check it out: Mozart Walker. Although the beach prohibits dogs, Mozart is allowed to go everywhere with his Mom Pat. She and her daughter Anne (our Social Worker) were attending the wedding of dear friends and of course, Mr. Socialite Mozart went too! Notice that outside Mozart wears his diabetic alert dog vest to identify himself as a service animal. Inside, even though he is still working 24/7/365, he relaxes and doesn’t wear his vest. 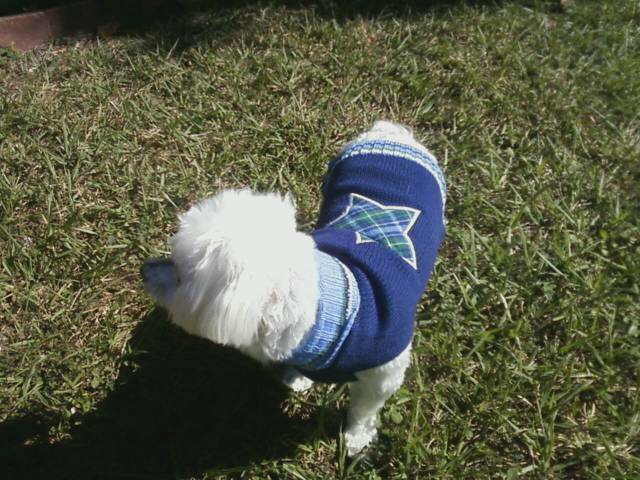 Mozart has vests in both blue and red, all with the Sugar Dogs International diabetic alert dog patches sewn on them. Mozart building his nest in the hotel. And finally, wiped out, “night, night!” That is unless his Mom Pat needs him! Did you know that dogs only nap for short periods of time? They don’t sleep like people do. Pat’s vet, Ark animal Hospital , believes that Mozart may be as old as 17 or 18 years now. Although his vision is in decline, Mozart is happy and still works every day. 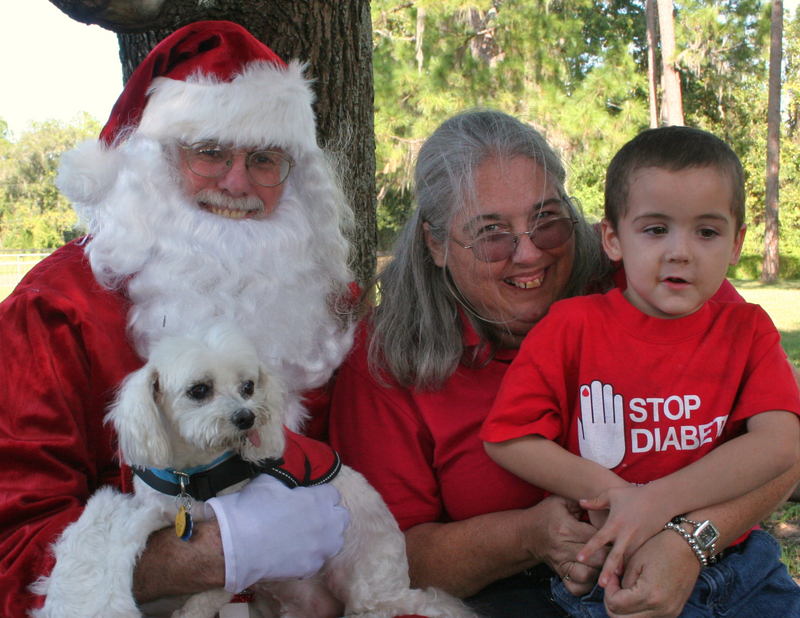 Happy Holidays from Santa holding Mozart, Anne (Pat’s daughter, our Social Worker) and William! Thanks to FloridaPoodleRescue.org for the photo op! 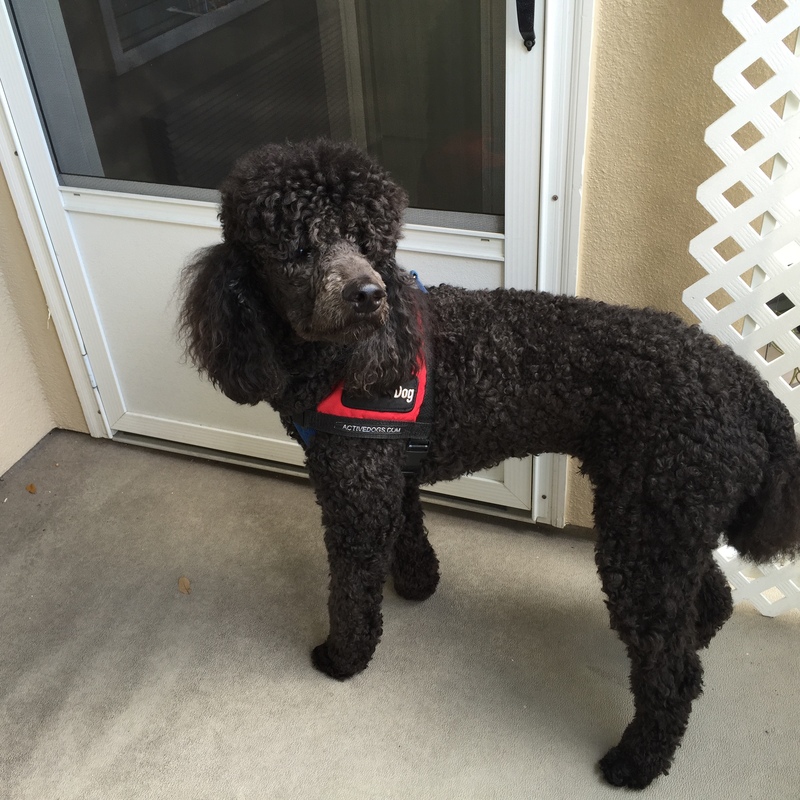 Pat began our Seniors Saving Seniors program several years ago and that is going great with Florida Poodle Rescue. 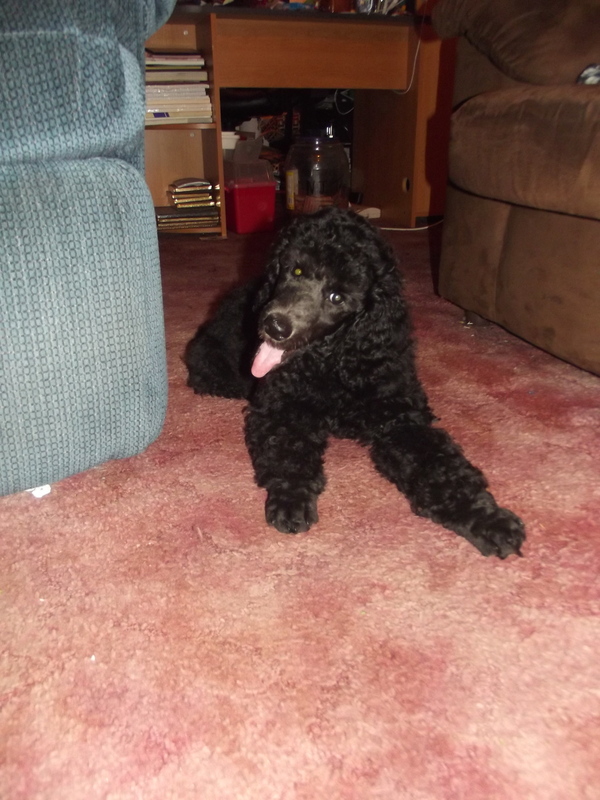 The exciting news in March 2014 was that she and her family had rescued two (2) male standard Poodle puppies. Pat’s moved into a smaller apartment so she’s only keeping Mozart and her son’s family is keeping both the standard male Poodles. They are still very close to Pat so all the dogs will still be together and learning and practicing obedience together. Yippee! Delight! Joy! Welcome home little doggies. Congratulations Pat on your beautiful new apartment! Unfortunately, Pat lost Mozart when he was 18 years old. He alerted until the very end of his life. His big brother Rocky is now a medical alert dog with her daughter Anne. Pat’s son and his wife have also kept Robert and he serves as a PTSD alert dog. Both Poodles are in excellent health and continue working.